Neptune on Longboat Key's location is the best of both worlds.While directly across from a secluded beach access leading to a wide, white sand beach and the crystal clear water of the Gulf of Mexico,it is still within walking distance to grocery,drug store, banks,post office,video rental, restaurants and public tennis courts.World renowned St Armands Circle is 3 miles away offering eclectic dining and upscale shopping.Located on the second floor,see and hear the gulf from the largest (by 125 sq ft)airconditioned one bedroom floor plan in the complex.The large walk in closet has ample storage to keep the condo's uncluttered feel. Newly painted and decorated,it also features the largest screened lanai from which you can see our beautiful sunsets! 2 coin operated washers and dryers in laundry room on site. Although we had only two days of “sunny Florida” our stay was very relaxing and the condo was very comfy and convenient. Enjoyed our stay. So glad that you enjoyed your stay. We try our best to supply everything we can to make your vacation the best it can be. We think we have a perfect location for a relaxing beach vacation but also close to restaurants,grocery etc. Hope to add you to the list of our returning guests! This is the second time we have stayed at this condo on Longboat Key. The location is perfect; right across the road from the beach, walking distance to Publix, CVS, tennis courts, Post Office and banks. It's a short drive to St. Armand"s and Sarasota to the south, and Anna Maria Island to the north. During our stay we made many trips to explore the area, and it's restaurants. Joan, the owner of the property, was a wonderful host, always quickly responding to our needs and requests. The property is immaculate, well furnished and thoughtfully supplied. We couldn't ask for a better place to spend March. We will return! A Great Stay- Alex V.
Well,Alex ,you pretty much summed up the reasons why we love this area and this condo in particular. Glad that you took advantage of all the opportunities that exist here.....truly a paradise. The conda was exactly as described and expected. 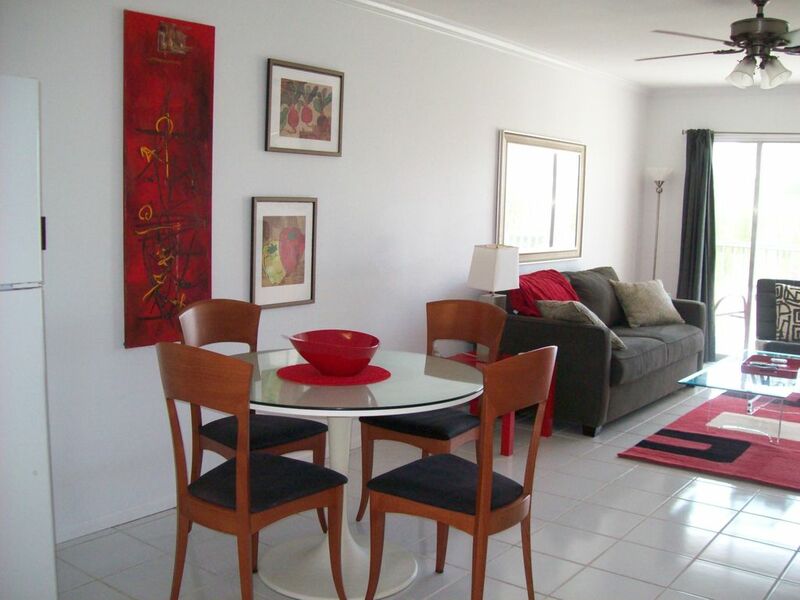 Very close to the beach, fully equipped with everything, very nicely appointed, and very nice owner. Would very much enjoy going back again and highly recommended. Best location for everything. We feel that others find our condo to be a great location and well appointed when we have returning guests.We are always striving to keep up our high standards that or guests enjoy, and of course the great location is perfect for a wonderful beach vacation! We loved your stay. The condo is clean and comfortable. Communication with the owner was great - she was very responsive and friendly. Location is also great - just across the road from the beach and very close to Publix. We had a great time and would definitely recommend.